Motor rotation is transferred to the legs via crank plates and linkage rods, causing the Mechanical Dog to walk. The dog’s stride depends on the crank holes to which the front legs are attached, which means there are four possible strides for you to choose from. Put this together with the two possible gear ratios and you’ve got an 8-speed puppy. Gripping parts at the end of each leg to change position according to speed for smooth movement. 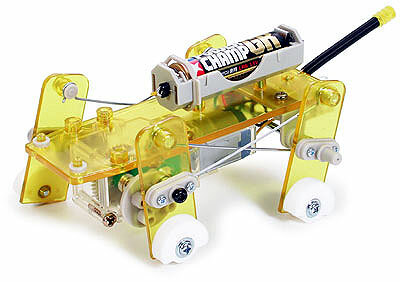 The body is made from a transparent yellow ABS resin that allows you to see all of the motors, gears, cranks, and linkage rods in action.